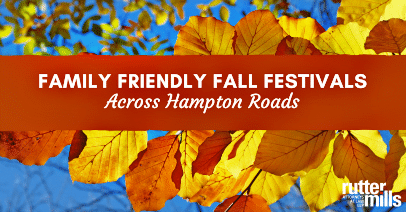 Autumn is upon us, so we’ve comprised this handy list of family friendly fall festivals throughout Hampton Roads happening now through October 31st, 2017! Have fun and remember – Rutter Mills is available 24-7 if you need us. Simply call or text us at 757-622-5000, or click here to email us. Friday, September 29, 2017 from 12:00 PM until 7:00 PM. Saturday, September 30, 2017 from 10:00 AM until 7:00 PM. Sunday, October 1, 2017 from 10:00 AM until 6:00 PM. Located at the Virginia Beach Oceanfront at 2nd-36th Streets, Virginia Beach, VA 23451. Highlights: The Neptune Festival Art & Craft Show features over 240 artisans displaying handmade work from paintings and sculptures, to photography and glasswork. Mosey your way through the tents and displays and find a piece of the show to bring home with you! Open every day from September 30, 2017 through October 31, 2017. 10:00 AM until 6:00 PM. Highlights: Celebrate the fall season every day and in every way with bushels of activities for the whole family! Come on out to the Fall Harvest Fair, which features Virginia Beach’s largest pumpkin patch, farm-tour hayrides, Hunt Club Farm’s Petting Farm and pony rides! On Weekends, the fun continues with inflatable amusements, carnival rides, food & novelty vendors and a DJ with music and games. Chase a chicken, feed a goat and visit a wide variety of animals on our petting farm. Saturday, October 7, 2017 from 11:00 AM until 3:00 PM. Located at the Brock Environmental Center at 3663 Marlin Bay Drive, Virginia Beach, VA 23455. Highlights: Enjoy children’s activities, fun and educational exhibitors, eco-friendly vendors, artisans, live music, local food & more! Saturday, October 14, 2017 from 10:00 AM until 4:00 PM. Located at the Virginia Beach Farmers Market at 3640 Dam Neck Road, Virginia Beach, VA 23453. Highlights: Featuring a craft show, farm animals, live music and more! Saturday, October 21, 2017 from 10:00 AM until 4:00 PM. Located at the Virginia Beach History Museums at 3131 Virginia Beach Boulevard, Virginia Beach, VA 23452. Highlights: Celebrate fall with activities for all ages. Learn about crops that were typically raised on a plantation, enjoy cooking demonstrations, try a drop spindle, and immerse yourself in daily life from long ago. Create a corn husk doll, make a hand-dipped candle, use a cider press to make apple cider, and paint pumpkins. Saturday, October 21, 2017 from 2:00 PM until 6:00 PM. Located at the First Landing State Park picnic shelter at 2500 Shore Drive, Virginia Beach, VA 23451. Highlights: Enjoy natural surroundings, hay rides, pumpkin decorating, children’s crafts, roasting s’mores and special exhibits. Saturday, October 7, 2017 from 12:00 PM until 6:00 PM. Located at 600 Claremont Avenue, Norfolk, VA 23507. Highlights: Chelsea West Fest, hosted by and benefiting Hope House Foundation, will be a full-day celebrating what makes this region great: local crafters, talented local musicians, local beers and brews, and the unique eateries just steps away from the festival. Saturday, October 7, 2017 from 10:00 AM until 3:00 PM. Located at Town Point Park in Downtown Norfolk, VA 23510. Highlights: Hampton Roads’ most exciting family festival is filled with more than 100 fun, creative and interactive activities that include storytelling, hands-on workshops, educational displays, cultural experiences, arts and crafts, military demonstrations, costumed characters and more! This event is designed with children 10 and younger in mind. Located at TowneBank Fountain Park in Downtown Norfolk, VA 23510. Highlights: The Mid-Autumn Moon Festival is often compared to America’s Thanksgiving tradition, and is a historic Asian holiday that marks the end of the summer harvest. This festival incorporates a wide range of entertainment and cultural programs that include storytelling, authentic Asian Ceremonial fashion shows, ribbon and dragon dancing, martial arts demonstrations, children’s activities, musical and dance performances, children’s lantern parade, and special appearances by the Moon Goddess. NEW! This year the Mid-Autumn Moon Festival will coincide with the 29th Annual Virginia Children’s Festival! Saturday, October 14, 2017 from 9:00 AM until 9:00 PM. Located at the Waterside District in Downtown Norfolk at 333 Waterside Drive, Norfolk, VA 23510. Highlights: This family-friendly festival will showcase Filipino American culture, food, and entertainment. Thursday, October 19, 2017 through Friday, October 20, 2017. Located at the Norfolk Arts District in Norfolk, VA 23510. Highlights: The *third* NEON Festival is coming back to Norfolk! This free festival welcomes everyone to experience the NEON District through art exhibitions, local and national performances and mural tours. Highlights of the 2017 celebration include: Third Thursday at the Chrysler Museum and Glass Studio and d’Art Center from 5:00 PM until 10:00 PM, The Plot Beer Garden and entertainment Friday evening from 6:00 PM until 10:00 PM, Norfolk Public Art Commission ribbon cutting Friday beginning at 5:30 PM. Saturday, October 21, 2017 from 11:00 AM until 8:00 PM. Located at Naval Station Norfolk, Pier 14 & Q Area at Decatur Avenue, Norfolk, VA 23511. Highlights: In looking toward the future, Naval Station Norfolk will offer a modern-day Fleet Fest to begin the start of the next 100 years. An event for the entire family, Fleet Fest will offer ship tours, static aircraft displays, children’s entertainment area, military demonstration, chili cook-off, car show, beer garden, food trucks and concessions. This event offers a day full of festivities to show appreciation to our service members and their families. Full schedule of events can be located by clicking the link below. Saturday, October 21, 2017 from 10:00 AM until 5:00 PM and Sunday, October 22, 2017 from 12:00 PM until 5:00 PM. Located at Stockley Gardens Park in the Ghent section of Norfolk, VA 23507. Highlights: Featuring live entertainment and kids’ activities throughout the day! Please click the link below to view the event schedule. Friday, October 6, 2017 through Sunday, October 8, 2017. Friday, October 6, 2017 from 5:00 PM until 9:00 PM. Saturday, October 7, 2017 from 9:00 AM until 9:00 PM. Sunday, October 8, 2017 from 9:00 AM until 3:00 PM. Located at Endview Plantation at 362 Yorktown Road, Newport News VA, 23602. Highlights: Come and enjoy medieval combat and encampments, knights on horseback, live music and dance, merchants, food and period games. Harvest Faire is a modern interpretation of a late 15th century European fall harvest celebration and tournament. Entertainers and a market mix with the sounds of good-natured martial competition and the smells of period cooking. Watch a craftsperson plying their trade, try your hand at games of chance and skill, and cheer for the warrior of your choice at the Field of Honors. Wander through 6 acres of village on a 22 acre site. Saturday, October 7, 2017 and Sunday, October 8, 2017 from 10:00 AM until 5:00 PM. Located at Newport News Park at 13560 Jefferson Avenue, Newport News, VA 23603. Highlights: Southeast Virginia’s biggest traditional craft show features over 200 vendors, traditional crafts and trades, folk entertainment, food vendors ($), and children’s activities. Saturday, October 14, 2017 from 11:00 AM until 6:00 PM. Located at Mariners Row in Newport News, VA 23606. Highlights: Enjoy live music with Border Line Crazy and The Joe Gosman Band. Artists, crafters, farmers and bakers bring their wares. Free kids craft area and hayrides. Craft beer, Ciders, and Wines available for sampling. Saturday, October 14, 2017 from 10:00 AM until 6:00 PM and Sunday, October 15, 2017 from 10:00 AM until 5:00 PM. Located at Loftis Boulevard and Jefferson Avenue in Newport News. For GPS purposes only: Styron Square in Port Warwick, 3100 William Styron Square North, Newport News, VA 23606. Highlights: Enjoy live music, exquisite food, family activities and artist demonstrations… all at the Port Warwick Art & Sculpture Festival! Thursday, October 19, 2017 from 4:00 PM until 9:00 PM. Friday, October 20, 2017 and Saturday, October 21, 2017 from 11:00 AM until 10:00 PM. Located at Saints Constantine and Helen Greek Orthodox Church at 60 Traverse Road, Newport News, VA 23606. Highlights: The Newport News Greek Festival is sponsored by the Saints Constantine and Helen Greek Orthodox Church. Enjoy great food, music and dancing! Friday, October 20, 2017 from 6:00 PM until 9:00 PM. Located at Fountain Plaza in City Center at 701 Town Center Drive, Newport News, VA 23606. Highlights: Enjoy live music by The Deloreans, craft beer, roasted oysters and other local seafood. Oyster shell recycling and activities for all ages make this a bushel of fun for everyone. Food and beverages ($). Free parking & admission. Saturday, October 21, 2017 from 12:00 PM until 5:00 PM. Located at Mariners’ Museum Park, Williams Fields, on Boundary Road across from Warwick High School. Parking will be on-site at Williams Field. Overflow parking will be in Warwick Lot along Warwick Boulevard. 100 Museum Drive, Newport News, VA 23606. Highlights: Barktoberfest (formerly Paws for a Cause) is the Peninsula SPCA’s annual fundraiser to benefit homeless animals! This year’s event will take on a new look and feel as we embrace (hopefully) cooler weather with a Barktoberfest fall festival in October! This family-friendly event will include rescues, vendors, exhibitors, and community partners, and of course, our annual dog walk! New this year will be some fun fall activities, live music and a craft-brew beer garden! And as always, all proceeds will benefit the animals and programs of the Peninsula SPCA. Saturday, October 28, 2017 from 11:00 AM until 10:00 PM. Located at City Center at Oyster Point at 701 Town Center Drive, Newport News, VA 23606. Highlights: Featuring fall-themed contests and tournaments, a petting zoo, hayrides, a pumping patch, games for the kids, live music and much more! Saturday, October 7, 2017 from 12:00 PM until 4:00 PM. Located at Benjamin Syms Middle School at 170 Fox Hill Road, Hampton, VA 23669. Highlights: The 5-Alarm Festival & Chili Cook-off is hosted annually by Hampton Fire & Rescue. One major goal of the festival is to bring awareness to the dangers of fire and to promote fire safety through educational and preventive activities. Cooking is the leading cause of home fires and home injuries, followed by heating fires. Featuring free home safety surveys and does a door-to-door campaign targeting residential areas where fires have occurred more frequently. The Division also has a free smoke detector program. Proceeds from the festival help to support that program and fire safety education and prevention activities throughout the city. This is a fun-filled family event with face-painting and crafts for the children. Saturday, October 14, 2017 from 10:00 AM until 5:00 PM. Located at Downtown Phoebus at W. Mellen Street, Hampton, VA 23663. Highlights: Historic Phoebus will transform into a vibrant outdoor street festival featuring handmade arts and crafts, community exhibits, food trucks, live music and craft beer. Friday, October 27, 2017 from 6:00 PM until 9:00 PM. Located at Phoebus Little League at 27 N Willard Avenue, Hampton, VA 23663. Highlights: A night of family fun full of games, inflatables, hay rides, food, vendors, trunk-or-treat, costume contest & more! Saturday, October 28, 2017 from 10:00 AM until 5:00 PM. Located at Bluebird Gap Farm at 60 Pine Chapel Road, Hampton, VA 23666. Highlights: Featuring a pumpkin patch, apple games, hayrides, huge straw mazes and climbing towers, and much more! Wednesday, October 4, 2017 from 4:30 PM until 6:30 PM. Located at the Chesapeake Health Department at 748 Battlefield Boulevard N, Chesapeake, VA 23320. Highlights: Enjoy an early evening of recipes, food demos, live music and kids activities and learn about sweet potatoes. For more information call (757) 382-6348. Saturday, October 21, 2017 and Sunday, October 22, 2017 from 2:45 PM until 5:00 PM. Highlights: This year marks the 21st annual Bark in the Park fundraiser, held in conjunction with Chesapeake Parks, Recreation and Tourism. It is Chesapeake Humane’s largest fundraiser of the year and is the city’s most talked about pet event. This is a rain or shine event. The festivities include the popular Radar Run, canine demonstrations and contests, animal rescue/welfare exhibitors, a variety of vendors, food trucks, live entertainment, our popular raffle and loads of fun for both the two- and four-legged members of the family. Saturday, October 28, 2017 and Sunday, October 29, 2017 from 10:00 AM until 4:00 PM. Located at the Dismal Swamp Canal Trail at 1200 Dismal Swamp Canal Trail, Chesapeake, VA 23323. Highlights: 2 days of celebrating with artists, friends, and community. Featuring painting, wood working, demonstrations, sculptures, photography, crafts, and live entertainment. Tuesday, October 31, 2017 from 6:00 PM until 9:00 PM. Located at Triple R Ranch at 3531 Bunch Walnuts Road, Chesapeake, VA 23322. Friday, October 6, 2017 through Sunday, October 8, 2017. Full schedule can be accessed by clicking the link below. Friday, October 6, 2017 from 6:00 PM until 10:00 PM. Saturday, October 7, 2017 from 10:00 AM until 9:30 PM. Sunday, October 8, 2017 from 10:00 AM until 5:00 PM. Located in Historic Merchant’s Square in Colonial Williamsburg at 134 North Henry, Williamsburg, VA 23185. Highlights: This free art festival is great for the whole family! Features include live music, food vendors and local activities. Williamsburg James City County public schools (K-12), many area private schools and surrounding counties will participate in the Youth Art Show! Artists’ work and food vendors will be on sale. Saturday, September 30, 2017 beginning at 10:00 AM. Located at Downtown Suffolk in Suffolk, VA 23434. Highlights: Bring your family out to the Peanut Festival Parade! The parade stages in the Lakeside neighborhood and proceeds down Washington Street, turning left onto North Main Street and concludes at Finney Avenue. Thursday, October 5, 2017 through Sunday, October 8, 2017. Thursday, October 5, 2017 from 2:00 PM until 10:30 PM. Friday, October 6, 2017 & Saturday, October 7, 2017 from 10:00 AM until 11:00 PM. Sunday, October 8, 2017 from 10:00 AM until 7:00 PM. Located at the Suffolk Executive Airport at 1410 Airport Road, Suffolk, VA 23434. Highlights: 2017 marks the 40th anniversary of Suffolk, Virginia’s premier festival. This family-friendly event honors the city’s agriculture heritage and devotion to peanuts, our favorite legumes. Known for its fun family activities, Suffolk Peanut Fest offers concerts, amusement rides, contests and competitions, a demolition derby, a truck and tractor pull, motorcycle rally, fireworks and much more. Combine all of these great activities with local and national entertainment and you have a weekend full of good times! Saturday, October 21, 2017 from 10:00 AM until 6:00 PM and Sunday, October 22, 2017 from 11:00 AM until 5:00 PM. Located at 3117 Kings Highway, Suffolk, Virginia 23435. Highlights: Two days of fun for the entire family! Entertainment by Hanks Martin, Tailgate Down, River Boyz, Daughters of the King, Colonel Cobb, and Ventriloquist. Driver Days Parade on Saturday beginning at 10:00 AM. Crafters & food vendors, corn hole tournament, Driver Days car show, Sherri Parker Memorial Poker Run & Bike Show, pony & train rides, children’s amusement area, knocker ball, pet costume contest, free rock painting tent. Saturday, October 14, 2017 from 8:00 AM until 3:00 PM. Located at Riverwalk Landing at 425 Water Street, Yorktown, VA 23690. Highlights: In addition to the usual array of fresh produce, meat and seafood, baked goods, specialty cut flowers, quality art, and entertainment, fall festival activities include hayrides, face painting, children’s games and activities, pumpkins and mums. This week’s featured bluegrass music entertainment is Henley Fork! Saturday, October 14, 2017 from 10:00 AM until 5:00 PM and Sunday, October 15, 2017 from 12:00 PM until 5:00 PM. Located at the Watermen’s Museum at 309 Water Street, Yorktown, VA 23690. Highlights: Enjoy this family-friendly event including re-enactors, sea shanties and maritime music, displays, vendors, maritime crafts, boat building, and more! On Sunday, October 15, 2017, enjoy a patriotic concert featuring the York River Symphony at 3:30 PM.